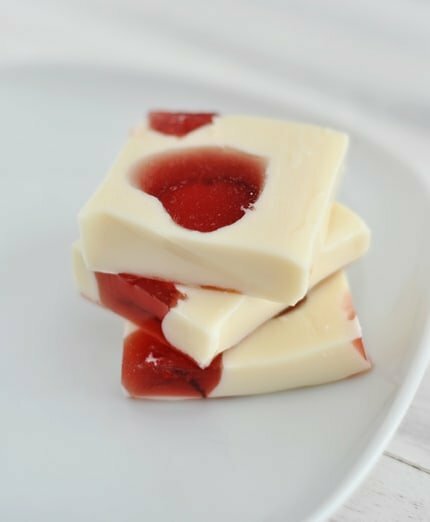 Once upon a time, I had this brilliant idea to make red and white heart Jello for my kids (henceforth in this post, Jello and gelatin will be used interchangeably). Ok, so it was only last week but since we never, ever eat Jello (as in the stuff that comes in a box) except for a few modernized Jello recipes using fruit juice and gelatin (like this sparkling homemade orange gelatin), I figured I would surprise the kids and do the same remake thingy with a fancy Valentine’s Jello jiggler I had seen on Pinterest. As a sidenote, I totally understand that my lack of Jello consumption is a tremendous travesty to many of you. I hope we can still continue to be friends. And no, I don’t think you are evil if you eat the real stuff. Clearly, I’m not viewing my remake as health food. Just a tiny bit less processed. Tiny. Bit. Anyhow, my adventure didn’t quite go as planned and my Jello jigglers did not turn out beautiful and perfect like I had wanted. More mosaic-style instead of the Jello masterpiece I had envisioned. I was tempted to not post them…until my kids slurped them up in a flash and begged for more (which could be related to the fact that Jello/gelatin treats are few and far between). I mean, who cares about looks if the kids are happy as larks? So while I may not earn mother-of-the-year for design quality, I have to say that the true experiment using fruit juice as the base really worked. I, who will not touch a Jello jiggler if it were slapping me in the face exclaiming that it is the last thing to eat on the planet, even sneaked a few snitches and quite enjoyed the fresh, vibrant taste of the little hearts. And I have no doubt you’ll be able to channel your Becky HomeEcky and make Jello jigglers that will be renowned for their taste and their awesome looks. Lightly coat a 9X13-inch pan with nonstick cooking spray and set aside. In a large bowl sprinkle the unflavored gelatin (4 packets) over the 1 cup of cold fruit juice. Let it stand for a minute or so. Pour the boiling fruit juice over the cold fruit juice mixture and stir until the gelatin is dissolved. Pour the liquid jello into the prepared pan and refrigerate on a flat surface (no tilting!) until firm, 2-4 hours. Remove the firm gelatin from the refrigerator. Using a small heart-shaped cookie cutter, cut the jello into hearts. Cut the hearts as close together as you can to minimize scraps (my children were more than willing to help "clean up" the scraps). Carefully and gently remove the hearts to a cutting board or plate. Using a flat, thin spatula may help lift the hearts up and out of the jello. When all the hearts have been cut, wash and dry the pan. Coat it again with nonstick cooking spray. Place all the small hearts onto the bottom of the clean pan, spacing them evenly. In a medium bowl, sprinkle the 2 envelopes gelatin (for the white jello) over the 1/2 cup cold water and let stand for 1-2 minutes. Pour the 1 1/2 cups boiling water over the gelatin and stir to dissolve. Stir in the sweetened condensed milk and stir until the mixture is cool (if it is warm at all, it will melt the red hearts, but don't chill it in the refrigerator or it will set up - just get it to cool room temperature). Carefully pour the white liquid into the pan with the hearts. Pour around the edges of the pan and pour slowly as the red hearts will be liable to want to float to different areas of the pan. Refrigerate on a flat surface until set up, about 2-4 hours. 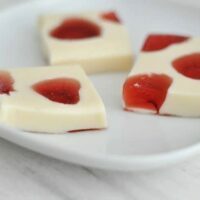 Cut into squares and flip bottom-side up to serve (if there is a thin film of white over the hearts once you've flipped them, you can easily scrape it off with a fingertip). Note: I used a no-sugar added cranberry cocktail fruit juice. You have to understand a juice like that will be far less sweet than traditional jello but I actually preferred it less sweet and more fresh-tasting. Choose a flavor of juice you prefer because that's exactly what it will taste like (in other words it's not going to come out tasting like strawberry flavored jello just because the juice is red). I used a glass pan but from others who have tried this around the internet, I suppose if you use a nonstick aluminum-type pan, you could try flipping the entire pan over so the jello releases in one beautiful slab. My glass pan was having none of that (i.e. big mess) so try at your own risk. See the very simple step-by-step photos below the recipe for a quick visual. I never knew I had an inner Becky HomeEcky, but then I made these for two parties and they were so cute! I did not have a tiny heart cookie cutter so I ended up with a 9×13 pan cut into twelve squares each with a medium sized heart in the middle. I got major rockstar points from my son (preschool valentine party) and my niece (valentine theme birthday party). Thank you! Hi Mel ! This is (I guess) a fan letter from one who does NOT do fan letters. Love your BLOG and your RECIPES–save and try MANY ! But mostly love your sense of humor and offbeat , self-effacing DELIVERY ! Keep up the great work ! I look forward to your “stuff”. Hi Ivy – it’s the can that is about 14 ounces. Ha ha, ha! Becky HomeEcky!!! Hilarious! The only kind of Jello I will eat is the kind with sweetened condensed milk in it! But I will have to give the fruit juice a try, because my kids will think this is fantastic. i can’t remember the last time i ate jello! and i know i’ve never seen white jello before–very interesting. this is a lovely idea, mel! I totally agree with you about the Jello, but I have to say these are adorable! That is awesome! 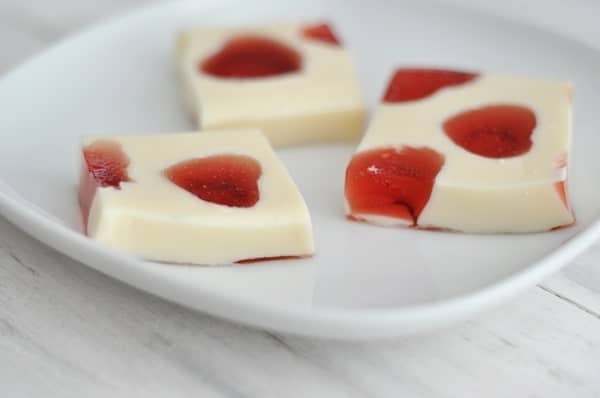 We always do mini jello hearts as a treat for school classes, so this will be extra special. Thanks! Thank you SO much for this idea! My son’s class is asking the parents do bring things in for their Valentine’s Day party – one mom already scooped up the cupcake request. Which I thought would be the most fun to show off, I mean, do for the class. So I signed up for jello. Then this post appears in my inbox this morning, so I was thrilled to see what thinking outside of the box can get you! Now my boring jello will be awesome jello!